With the weather changing, we all know what is coming (if you haven’t seen it already): snow. The white flurries that fill the sky and make us grumble at times is on its way to bring snow days, snowball fights, snow angels, and best of all: snowmen. While we can’t bring these creations inside, we can bring replicas of some of them into our classrooms to help create a winter wonderland of snow! There are several ways to bring happy little snowmen (and women) into your classroom with fun winter crafts that can be fun and educational; here are my top 7! #1 Shape It: If you are working with your students on shapes, you can have them create a snowman using a variety of shapes for different parts of their body. Here’s what your directions could look like. Make three circles! A big one, a medium sized one, and a small one. On a different color of paper, make a long skinny triangle. On another color of paper, draw three small squares that are about the same size. On the same color paper you drew your squares on, draw five teeny, tiny circles. On a new color, draw two long skinny rectangles and three short skinny rectangles. Now cut out all of your pieces and put your snow man together. Optional: Add a scarf and a hat. #2 Save the Melting Snowmen: Have you ever done an escape room with your students before? This is a fun math game that gets students working together, solving puzzles, and doing math. Your kids will be so engaged, they won’t even realize they are doing math! This game is available for 1st-5th grades. You can also find this game in digital form for 3-5 grades! #3 Show the love: Another way to make a snowman in your classroom is to print out an outline of a snowman and give students cotton balls. If you want to turn this into a character lesson, you can have students color their cotton balls any color they would like. You can talk about how each of the snowmen are different, but they are all snowmen regardless of what they look like. This can be a lesson in how being different doesn’t make you bad or wrong. Then have all of your students add a heart to their snowmen to remind us of the most important part of people: their heart. #4 A Roll of the Dice: This is a great way to make a snowman while playing a game. Create a worksheet that has all of the parts of a snowman (the eyes, mouth, nose, arms, hat, and scarf) and assign each part a number. Have students roll the dice to see who can complete their snowman first. This is another great character activity. This game gives you the opportunity to talk about being a good sport and being happy for others even if you are not doing well (which is a skill we all need). #5 Combine STEM with an Escape Room: If your students love STEM/STEAM activities, and escape rooms, why not combine them both? 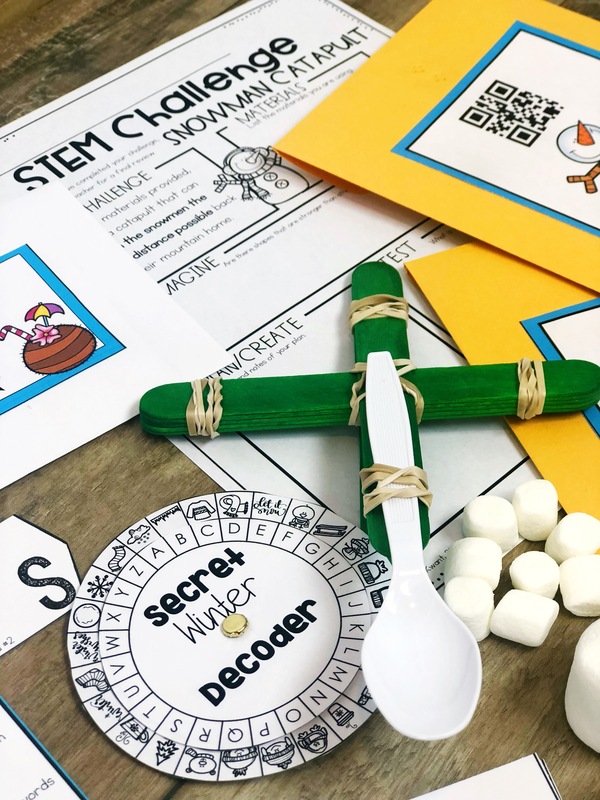 In this game students will be building a catapult to help the snowmen who are vacationing at the beach, make it back to the snowy mountains before they melt. This game is available for lower and upper elementary grades. #6 Play it up: With the activity, you can teach kids how to collaborate, write, and create fun and interesting characters! Put students into groups of three or four, whatever works best for your classroom. Then ask them to give each of the snowmen a personality that can be portrayed through something they have on. For example, students might say a snowman is grumpy because he has a red scarf or lucky because his scarf is green. Then have your students write a play and perform it with snowmen puppets they make from a popsicle stick, small white plates, and construction paper. If you wish, you may also use dowel sticks in place of popsicle sticks. #7 Snack Time: A fun activity to do with students is a craft they can eat. You will need marshmallows, pretzel sticks, chocolate chips (or any other kind of small candy), and white frosting. Have students use frosting as glue to put three marshmallows together. Then put the sticks into the sides for arms. Finally, use the frosting to put the chocolate chips and any other candy on there to give your snowman some fun physical features. There are so many ways to bring some snowman fun into your classroom. 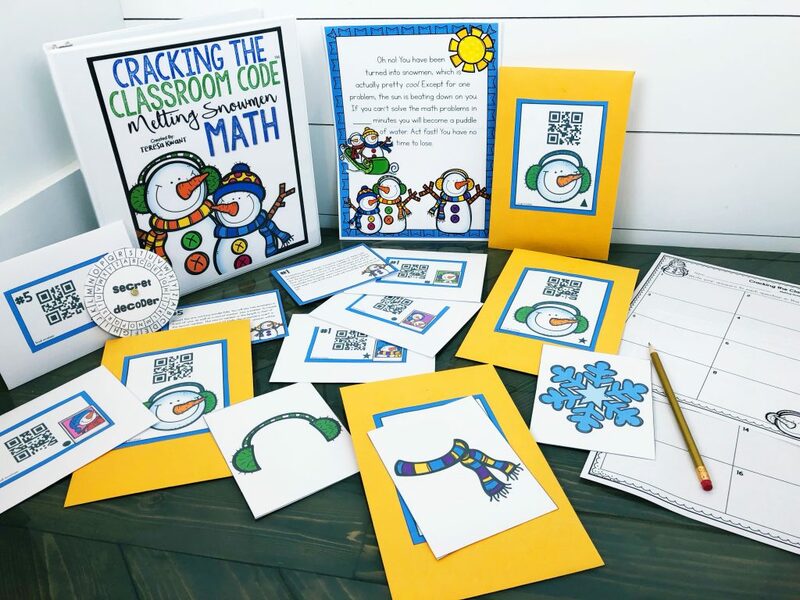 Make every activity a fun learning activity that not only gives your students a fun snowman, but also teaches them about shapes, character, math, and more!